Ofosu Jones-Quartey is a meditation teacher and practitioner, whose focus in both teaching and practice stems from the Burmese style of vipassana as taught to him by his teacher Bhante Buddharakkhita, from the lineage of Mahasi Sayadaw. Ofosu's outlook however, incorporates viewpoints from the Mahdyamaka-Prasangika school of Tibetan/Mahayana Buddhism as well as other spiritual traditions and philosophical backgrounds ie Christianity, Judaism, etc. He has been teaching the Insight Meditation Community of Washington's (IMCW) Family Meditation Class with his co-teacher Jennifer Jordan since 2008. He has been working with Minds, Incorporated in bringing mindfulness practice to schools, working with students directly in the classroom since 2014. An accomplished musician, Ofosu also performs both domestically and internationally as a Hip Hop and Electronic Music artist. His writings on how he incorporates his Buddhist philosophy into his secular music have been published by Mahachulalongkorn University in Ayutthaya, Thailand. 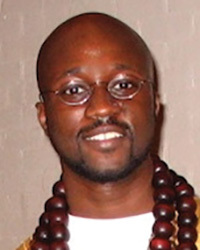 He currently lives in the Washington, DC area with his wife Ayanna and their three children, Sundara, Samadhi and Sati.